During Fashion Week it’s easy to get side-tracked with celeb sightings, crazy street style and after parties! The shows and presentations are a big production and what they are really all about is forecasting next season’s trends! We saw a ton of chic looks and put together our list of the biggest trends for Fall Winter 2012. From feminine menswear and fabulous furs, to sophisticated cut outs and sensual pleats, we can’t wait for another fall to arrive! I love the look of a waist-length mink jacket. This collarless style has 3/4 length sleeves and is flattering on everyone because of its shape. Looks great with day dresses, black tie or skinny jeans and boots. I am wearing it here with a fitted Jay Godfrey shift dress that I recently purchased. This jacket is a lot of look for less and is constructed just like the mink. It’s very soft and you can wear it with many different outfits. Has a similar feel to sheared mink. This Chinchilla jacket is an all-around winner with it’s gorgeous color and chic style. It’s super luxe yet works day to night. I have never felt anything softer! This fun fur is dyed for the same look of chinchilla but at a fraction of the price. I just got one as an anniversary gift…LOVE! All available in sizes S-M-L; XS can also be ordered. Contact Jenny Roberts at jenny@pologeorgis.com or call her at (212) 563-2250 to order. Mention PageDaily for a special 10% discount! 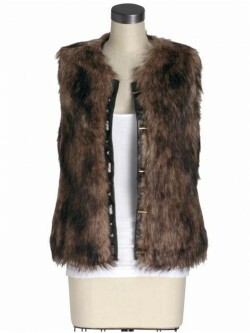 BB Dakota Ashland Vest: Get FURocious Style This Season!